The GMT-Consortium Large Earth Finder (G-CLEF) is a cross-dispersed, optical band echelle spectrograph to be delivered as the first light scientific instrument for the Giant Magellan Telescope (GMT) in the mid 2020's. G-CLEF is vacuum-enclosed and fiber-fed to enable precision radial velocity (PRV) measurements, especially for the detection and characterization of low-mass exoplanets orbiting solar-type stars. The passband of G-CLEF is broad, extending from 3500Å to 9000Å, and provides sensitivity suitable for stellar abundance studies and for observing high redshift phenomena. The design of G-CLEF incorporates several novel technical innovations. G-CLEF will be the first PRV spectrograph to have a composite optical bench so as to exploit that material’s extremely low coefficient of thermal expansion, high in-plane thermal conductivity and high stiffness-to-mass ratio. 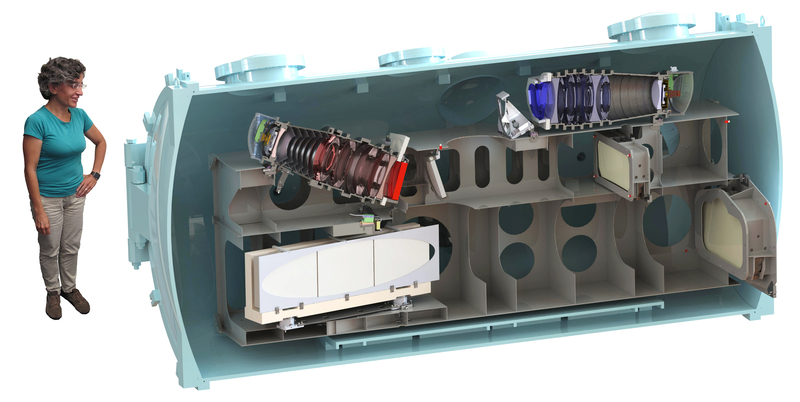 The spectrograph camera subsystem is divided into a red and a blue channel, split by a dichroic, so there are two independent refractive spectrograph cameras. The control system software is being developed in model-driven software context that has been adopted globally by the GMT.